Description: One day, a mysterious stranger arrives at a boardinghouse of the widow Gateau- a sad-faced stranger, who keeps to himself. When the widow's daughter, Mirette, discovers him crossing the courtyard on air, she begs him to teach her how he does it. But Mirette doesn't know that the stranger was once the Great Bellini- master wire-walker. Or that Bellini has been stopped by a terrible fear. And it is she who must teach him courage once again. 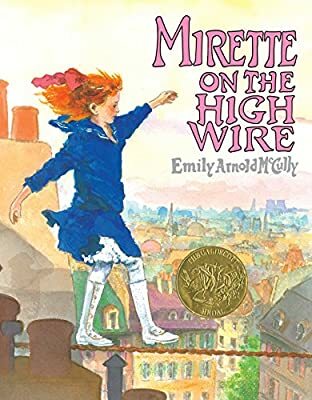 Emily Arnold McCully's sweeping watercolor paintings carry the reader over the rooftops of nineteenth-century Paris and into an elegant, beautiful world of acrobats, jugglers, mimes, actors, and one gallant, resourceful little girl.